Thrasher Trailways is proud of its Safety Record. When you choose a Rental Charter Bus in Birmingham, AL, you need to know and review its Safety Record. Choosing a Rental Charter Bus in Birmingham is so much more than just the price. Not all Rental Charter Buses have the same safety record of Thrasher Trailways. Thrasher Trailways has the Top Safety Rating from the Federal Government Department of Transportation. On top of that, Thrasher Trailways also has the Top Rating with the Department of Defense. Our brave men and women of the United States Military put up with all types of challenges as they protect our great country, but they will not just ride with any bus company. In order to have the honor of carrying our United States Military, a bus company has to go beyond the basic safety rating of the United States Department of Transportation and must earn top safety ratings with the Department of Defense’s safety audit. Of the more than 4000 registered motorcoach companies in the United States, only 10% of those companies have earned this additional safety rating of the D.O.D to carry the military. Thrasher Trailways is honored to have earned this top rating to be able to carry our great men and women serving our country. If the military will not travel with any bus company just based on price, why should you? Safe travel must be your deciding reason when choosing a Charter Rental Bus in Birmingham. 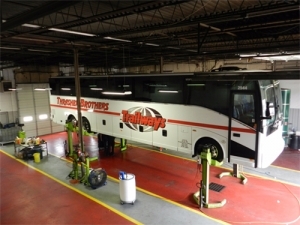 One of the ways we keep our Safe Bus Rating is that Thrasher Trailways has a State of the Art Maintenance Facility, fully staffed with trained and experienced professionals who do daily inspections and preventative maintenance on our modern new fleet. A Charter Rental Bus Company in Birmingham cannot just promote new buses. Even new buses have mechanical issues. However, when you have a fleet maintenance facility with parts, and all the tools needed, by continuous fleet preventative maintenance issues are reduced to the absolute minimum. Thrasher Trailways has such a well-trained staff as well as a top facility, other bus companies, as well as University and Schools bring their equipment to Thrasher Trailways for repairs. When other bus companies are bringing their equipment to Thrasher Trailways, you can be assured that your bus has been well maintained as well. We invite you to look at other maintenance facilities and then come visit our Offices and Maintenance Center. Call us today!